If you need to return a product, please send this request HERE. If you are calling about an existing order, please locate your order number prior to phoning. If calling requiring tech support for a particular product, please if possible make this request HERE. Submitted an order, but have NOT received order status updates? It is possible that the email sent did not arrive or was blocked by your ISP. Get REAL-TIME order status information by clicking HERE. Get immediate detailed order status information (such as Received, Sent for Picking, Shipped), or if applicable - any backorder status notes. 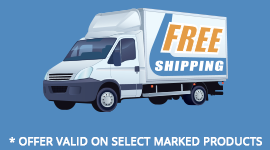 Click HERE to LOGIN and review your orders. Please click HERE to request an RMA. If you do not have your order number handy, please click the My Account at the top menu, log in, click VIEW ORDER HISTORY. Displayed will be an RMA link directly to the right of the order number. Sales questions, technical support, existing order questions or issues, quotations, etc. We will respond within 24 hours or sooner (except holidays and weekends) to all inquiries. This is the BEST way to get your FASTEST response. Please do NOT contact us by email for product returns. See above information at the top of this page. Monday to Friday, 7:30am to 5:00pm. Governments, Schools, and universities may fax their purchases orders to the below number. PO's from any other organization must be pre-paid by major credit card or company check before order can be shipped. Full contact information must be provided (contact name, phone number, bill/ship-to address). All PO's are phone verified.